Louis van Gaal is not convinced that Ole Gunnar Solskjaer has changed Manchester United's style since taking over from Jose Mourinho, and believes he is guilty of "parking the bus" just like his predecessor. Solskjaer has revitalised United's form and morale since taking over on a caretaker basis following Mourinho's departure in December. Although consecutive defeats to Arsenal in the Premier League and Wolves in the FA Cup have dented their campaign, United have got themselves back into the top-four race and are in the quarter-finals of the Champions League under their former striker. 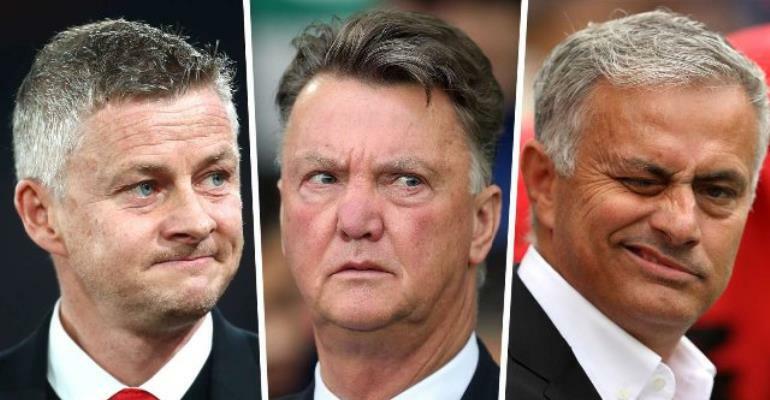 No decision on a permanent appointment has yet been announced, but while admitting that Solskjaer deserves credit for creating a more positive atmosphere, Van Gaal – who managed the club between 2014 and 2016 – believes he is guilty of tactics every bit as negative as Mourinho's. "The coach after me [Mourinho] changed to park-the-bus tactics and played on the counter," he told BBC Sport. "Now there is another coach who parks the bus and plays on the counter. The main difference between Mourinho and Solskjaer is that Solskjaer is winning. "I am not there but there does look to be a change and the atmosphere seems to be better. It is also true that Solskjaer has changed Paul Pogba's position and put him into an area where he is much more important. "But the way Manchester United are playing now is not the way Ferguson played. It is defensive, counter-attacking football. If you like it, you like it. If you think it is more exciting than my boring attacking, OK. But it is not my truth. "Solskjaer has just lost twice and he has to manage that. It is very important that Manchester United qualifies for the Champions League, as it was when I was manager. "But they can also win the Champions League because they play a defensive system and it is very difficult to beat them, which, whether you like it or not, is the result of Mourinho's work." The Dutchman – who announced his retirement from management earlier this month – was famed for blooding youngsters throughout his illustrious career and is less than impressed with the chances afforded to young players under his successors at Old Trafford. He says: "I read something from Mourinho saying I only did that out of necessity [playing young players]. Not true. I created the necessity. "Manchester United had over 30 players. I brought them back to 23. Then I had an open selection for the youth academy. I did that at every club. That is why a lot of young players have made their debuts with me. "A lot of trainers, like Mourinho, never give youngsters a chance. Yes, five minutes. Solskjaer, 10 minutes. That is not a chance. A chance is a game. "Too much experience is not good. Then you have an automatic pilot. You always need imagination and you cannot forget how inspiring young players can be. "If you are not willing to trust young players, you are not suitable to be a manager of a club with a youth education."